Still adjusting, let me know what you think. We need to replace fossil fuels. We do have fuels left. But, go ahead 21 years and everything looks different [8, 9, 23]. Many nations will be out of oil and gas. They are going to compete for what is left. You could be alive then. Clearly, no one can predict the future. But when these fuels are gone, they will leave a big hole. About eighty percent of worlds’ energy comes from fossil fuels . Replacing with renewables will be a backbreaking task. Al Gore has made a serious argument that it can be done, particularly using geothermal . This needs to happen now - and it will not be easy, especially considering the scale [21, 26, 27, 28, 29]. Fusion crushes other options, by a huge margin. Getting off fossil fuels is going to be very hard. Our civilization is designed for it. Practically every car, plane, train, or generator uses combustion. Companies, governments and organizations are designed around this fuel. More fundamentally - people just do not understand alternatives. Fossil fuels are as intertwined with society, as the air we breathe. Strong forces will be needed; needed to wrench us from fossil fuels. These could be political, environmental or economic. Political forces have been pushed by Thomas Friedman . He argues we need a “carbon tax”. A tax that makes a market for renewables. It is a great plan – but it has not worked. Today, 83 percent of nations have no carbon tax [3, 4, 5]. The biggest emitters US and China have no laws enacted. The actual tax has little effect. The firms that see it, pay, and continue working. Political will is not enough to permanently rewire the world. It may work in some countries, but not everywhere. It may work eventually, but not fast enough. It may work for periods, but not forever; all because fossil fuels are so cheap. An environmental force could also break our addiction. We burn fossil fuels and it heats the planet. This creates havoc, forcing us to stop. This is already happening. Climate change is real . The burning of fossil fuels is a major cause of it . But, we have not stopped yet. Hopefully, we do not reach the bitter end, to finally get the changes we need. To stop climate change, someone needs to get obnoxiously rich. Money drives much of this world. The cheapest option normally wins. Alternatives may work for a while; but the incentive is always towards cheap. This is true in rubles, euros or pesos. It has been true over time. Realize, that since the dawn of the industrial age, fossil fuels have always won because of price. In the 250 years, many governments, eras and markets have come and gone but fossil fuels have remained. Price; is the only thing that can dislodge them. 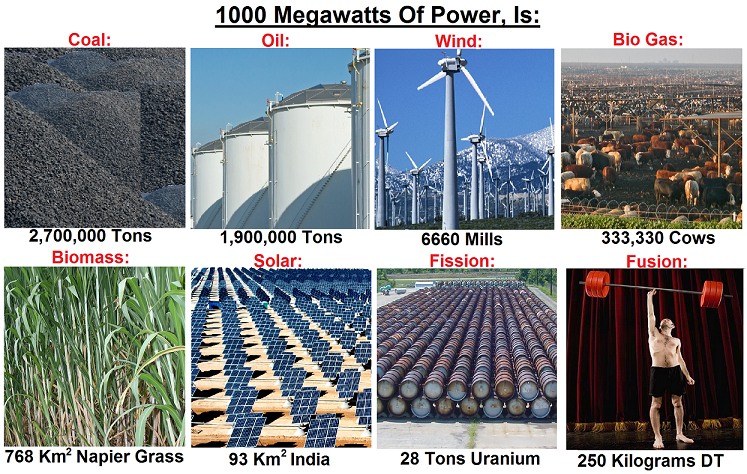 First, the graph should by in 1000MW-years, not MW. Second, the prefix for kilo is a small k, not a capital K.
Third, thorium in a LFTR would be about 800kg. Sorry, but the moment you cite Al Gore as a reference you've lost your argument. Conservative, liberal, ect… Al Gore and his supports have put in a serious argument which merits a mention, when it comes to energy discussions. You can agree or disagree with his ideas - but they should be included. C. Napier Grass predictions came from this paper on a project in Thailand: Vivanpatarakij, Supawat, Weerin Wangjiraniran, Raksanai Nidhiritdhikrai, and Dawan Wiwattanadat. "Potential Study of Electricity Generation 1000 MW with Biogas in Thailand." Advanced Materials Research 622-623 (2012): 1209-212. Print. D. Cow calculations came from this paper (with conversions) I want to find a better source, Ideally numbers for a real 1000 MW plant. Otaraku, Ipeghan, and Evelyn Ogedengbe. "Biogas Production from Sawdust Waste, Cow Dung and Water Hyacinth-Effect of Sawdust Concentration." International Journal of Application or Innovation in Engineering & Management (IJAIEM) 2013th ser. 2.6 (2013): 91-93. Web. June 2013. <http://www.ijaiem.org/Volume2Issue6/IJAIEM-2013-06-04-002.pdf>. Obviously were talking about rated capacity here, the maximum power possible. The wind number probably needs re-examining. Finally, adding Thorium would be good. Also, don't argue with me on climate change. There is a 97% consensus in science literature on this - it is happening, we are the reason. There are reams of reports, papers, documents and measurements, stretching back decades. There is also a wall of endorsements from many national and international organizations. When it comes to climate change, it's not if it is happening, it is what we can do to stop it? Should commercially viable fusion be part of a solution? If yes, then we need to put cash behind some new fusion ideas. We need to do that now. Have you ever heard of The Azimuth Project? Part of their goals and directions are guided by the idea of "Plan C", as in Plan A is business as usual will fail, Plan B is what happens when we try to fix that mistake, and Plan C is when we fail to fix that mistake (which is highly likely because prevention *now* requires a lot of work that we're not going to put in) and this is the route we should be planning for. Bypass them all and go to Plan "L" unless Plan "P" shows enough promise first.